Many glass lampworking torches work best at 3-20 psi, depending on torch manufacturer, and our regulator lets you set pressure exactly right for your torch. The TB-60 Torch Booster is the right torch booster for a glass lampworker using a larger torch such as a Carlisle CC or who operates multiple torches in a class room setting. The TB-60 can supply up to 6 minor class torches at the same time. Read more about the advantages of using a G-TEC Torch Booster in a classroom setting. 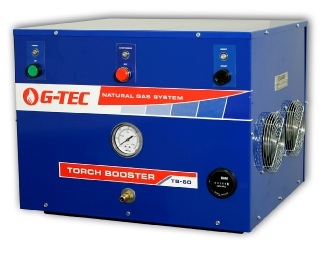 The TB-60 system supplies 60 cubic feet of natural gas per hour at 25 psi. 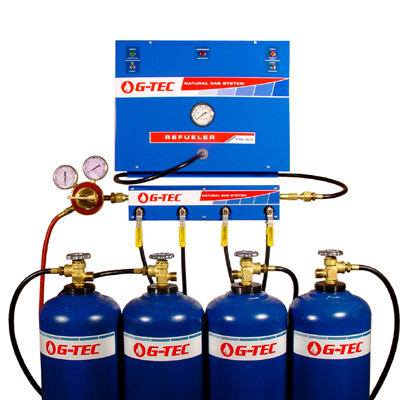 Many TB-60 users also purchase a regulator to set gas pressure at 3-20 psi, depending on torch type. One-year/2,000 hour parts and labor warranty. Read G-TEC’s warranty. deliveries in New York State. The TB-15 Torch Booster is the right torch booster for a glass lampworkers who use a smaller torch such as a Minor, Bobcat, Lynx, Piranha, Mini CC or Little Dragon. 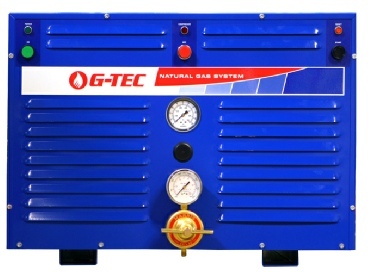 The system supplies 15 cubic feet of natural gas per hour at 25 psi. Many TB-15 users also purchase a regulator to set gas pressure at 5 - 20 psi, depending on torch type. warranty. Read G-TEC’s warranty. Read sales terms and conditions. 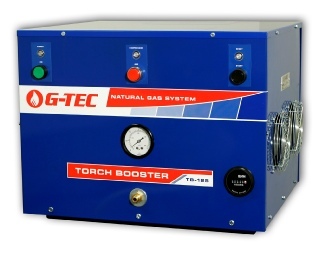 The TB-30 Torch Booster is the right torch booster for glass lampworkers with a mid-sized torch such as a Mid-Range, Cheetah or Barracuda.The system supplies 30 cubic feet of natural gas per hour at 25 psi. 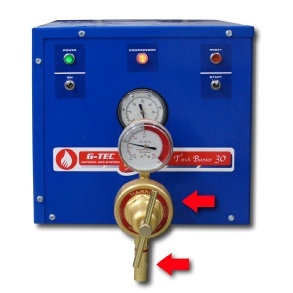 Many TB-30 users also purchase a regulator to set gas pressure at 5 -20 psi, depending on torch type. One-year parts and labor warranty. Read G-TEC’s warranty. The TB-125 Torch Booster is the right torch booster for a glass lampworker using a larger torch such as a Carlisle CC Plus, GTT Delta Red Rocket/ Red Max or who operates multiple torches in a class room setting. The TB-125 can supply up to 12 minor class torches at the same time. Read more about the advantages of using a G-TEC Torch Booster in a classroom setting. 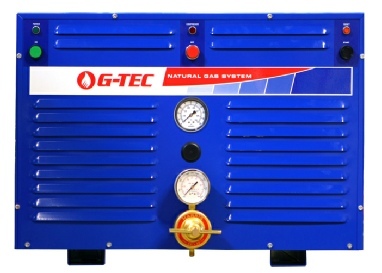 The TB-125 system supplies 125 cubic feet of natural gas per hour at 25 psi. Many TB-125 users also purchase a regulator to set gas pressure at 3-20 psi, depending on torch type. TB-250 Torch Boosters are for large glass lampworking facilities with multiple large torches, such as a production facility or studio that offers rental studio time. Read more about the advantages of using a G-TEC Torch Booster in a classroom setting. This system cannot be purchased for installation in New York City - click here for TB-250 Torch Boosters for New York City. Our regulators screw right onto the front of the Torch Booster and make it easy to set torch pressure between 1-44 psi; standard Torch Booster pressure is 45 psi. Model 247-50 regulator lets you set pressure up to a system maximum 45 psi. 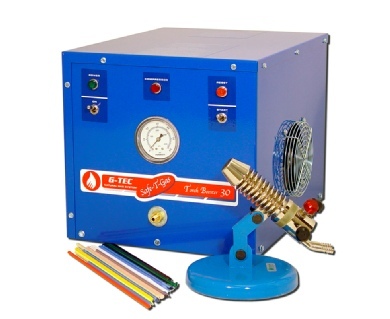 TB-500 Torch Boosters are for large glass lampworking facilities with multiple large torches, such as a production facility or studio that offers rental studio time. Read more about the advantages of using a G-TEC Torch Booster in a classroom setting. M-T cylinder has a ready supply. hose to connect the system to the utility gas pipe. are several lampworkers, such as in a commercial shop making scientific glassware. 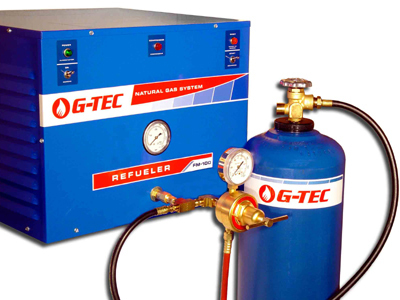 minute or Refueler 180 which refills cylinders at a rate of 3 cubic feet per minute. 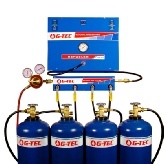 NG-130 cylinder holds 130 cubic feet of gas at 275 psi. 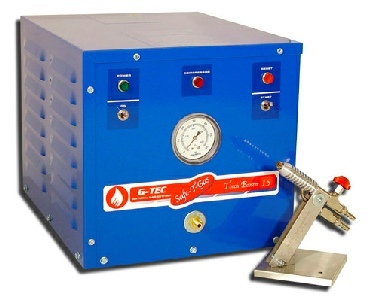 allows exact pressure to be set for the downstream torches.